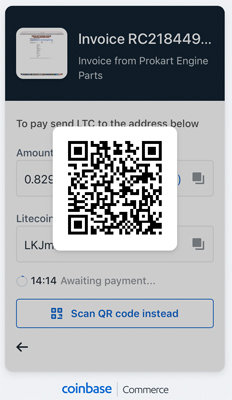 If you would like to pay by cryptocurrency please follow the following steps. Once you have selected all the parts you require and have added them to the shopping cart click on the "Checkout" button and fill in your Billing and Delivery details. Then click the "Crypto Currency Payments" button. 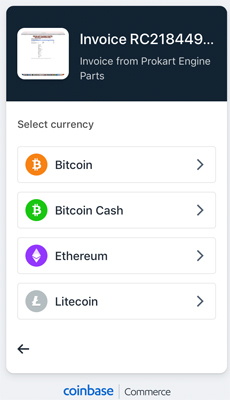 Once we have received your order we will send you an email with a link to Coinbase Commerce where you will be able to pay your invoice by the cryptocurrency of your choice. 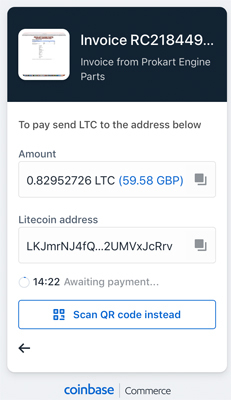 Using your own crypto wallet copy the Amount to be Paid and the Litecoin Address and send payment. 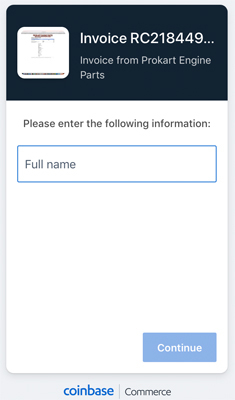 Once payment has been received in our Crypto Wallet we will send you a confirmation email that payment has been received and your order will be processed. You then set the delivery charge by selecting your location from the pull-down menu and then your postal method. For more information on paying by cryptocurrency please click on the image above.